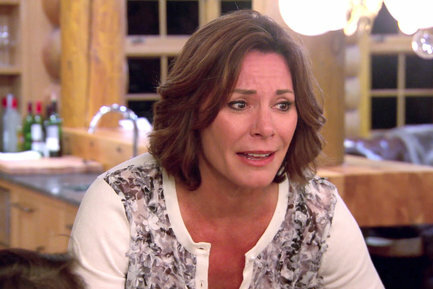 Luann D’Agostino is taking to her Bravo Blog to dish on this week's episode of The Real Housewives of New York City. Luann D’Agostino explains why she had it with Sonja Mogan and recounts the moments she had to excuse herself to "wash her hands" in order to avoid some sticky situations. "So fun to be a part of A Bronx Tale... Housewives edition! I hadn’t been to the Bronx in about 15 years, and I wasn’t let down by the restaurant Bethenny chose. The pizza was fabulous! Sonja needs to stop dragging Dorinda into her Tipsy Girl drama. Dorinda was very clear from the beginning that she never intended to invest in that business...end of story! Once the shouting began, I decided it was time to “wash my hands” in the hopes that when I returned, the ladies would be ladies. At lunch, Bethenny invited everyone to a ski weekend at Stratton, Vermont. Her invitation diverted our attention to something positive, even if Ramona only skis in Aspen. I grew up in Connecticut, so I like to ski in Vermont. What is up with Sonja and her disrespectful attitude towards my marriage? When we were at lunch at the Saint Andre Café with Ramona, why did she have to mention sleeping with Tom? How rude! She always says she’s just joking, but she’s been relentlessly sarcastic when it comes to my marriage to Tom. What is Sonja’s threshold for rudeness? I’d reached my limit with her and decided it was better to leave our lunch than to stoop to her level. It’s always risky to be the last one to arrive when vacationing with the ladies. We’ve seen time and again how Ramona and Sonja try to grab the best room for themselves, but this time they were thwarted by Dorinda with a little help from Carole. I was hoping one of them would have been thoughtful enough to keep me out of the basement, which, by the way, had a bathroom down the hall with no electrical outlets. Live and learn. Remember, this trip took place right after I got back from my wedding, so I was still in marital bliss mode! Although it might not have seemed like it, I was very happy to be there and was grateful to Bethenny for inviting us on this trip. The house was really beautiful, even the basement! Until next week, remember you have to get up the mountain before you can enjoy the ride down."